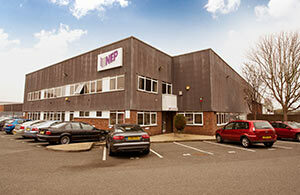 Like polishing all drilling requirements are processed in-house at NE Plastics. 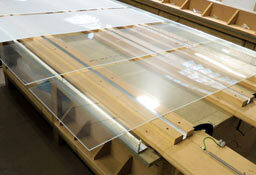 We can drill holes into virtually all of our held substrates: Acrylic; Polycarbonate; Foam PVC; Aluminium Composite. For jobs without a CAD file we will need both the hole size and the centre (dimension from the edge of the panel to the centre of the hole) we are drilling to. We can drill holes to suit stand-offs when required, which are available in a range of finishes and sizes. When drilling large panels or more intricate holes, we will often use our CNC router. The CNC can also accommodate larger hole sizes. When a high level of accuracy is needed or where polished holes are required, we can offer a laser cutting service. We can offer manual drilling services where machining is not practical or cost effective. This enables us to deal with small one off jobs where setting of machinery would be costly. When drilling your own holes from our substrates, it is always recommended that you seek consultation before proceeding first. Having the appropriate tools and drilling at the correct speed will determine the finish of any project, each substrate has different methods to achieve the best finish. We regularly get enquiries about how to properly drill acrylic – so for an in-depth answer please consult our technical sheet ‘Working with acrylic’. 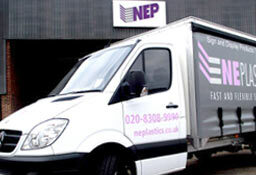 We can both countersink and bore holes at NE Plastics to fit screws, stand offs and bolts flush to a panel. Either through manual fabrication or CNC routing, countersunk holes can be incorporated to a drill hole. A countersunk hole is drilled when a v-shaped head on a screw is present. When a circular head is present on a stand-off, screw or bolt, a bore hole can be introduced for a flush finish on a panel. Boring can only be completed through CNC routing. We can incorporate Tappex inserts as part of our drilling service at NE Plastics. We can offer either steel or brass inserts which can be added to a drilled hole. These are often used where demountable display are necessary. 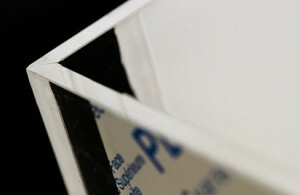 Using Tappex reduces the risk of chipping and cracking the panel, it is usually incorporated with acrylic.